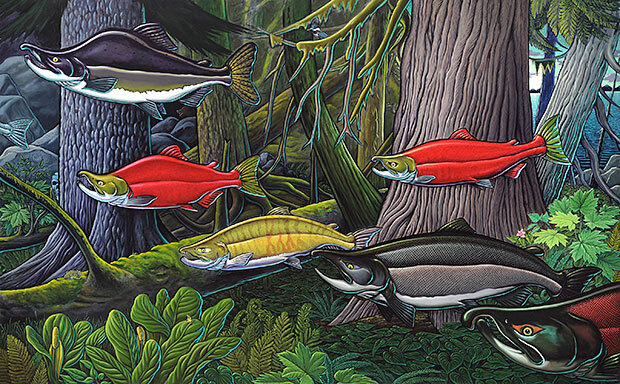 Evening at Egan 2009: Fridays, September 18-November 20, 7 p.m.
Ketchikan fish artist Ray Troll kicks off the series and features his latest works September 18 with a talk he calls “Further Adventures in Scientific Surrealism” at 7 p.m. in the Egan Library. New! First Friday October and November Bookstore events 4:30-6:30 p.m.
U.S. foreign policy in Afghanistan, new deep sea video technologies and French crime novels are just a few of the topics in the line up for this Fall’s Friday night Evening at Egan series. Oct. 2 UAS faculty Robin Walz presents “Rogue Cops, Elegant Criminals, and the Popular French Crime Novel” in the Egan lecture hall. His talk is preceded by a pre-lecture Bookstore by the Bay event 4:30-6:30 p.m. Several of Walz’ books on the history of popular culture in modern France will be available. Ceramics faculty Jeremy Kane will speak about his artwork and influences in “15 Years of Clay” October 23, Egan Lecture Hall. The Bookstore by the Bay will host another First Friday event on November 6. UAS ceramics students and art students will display and sell their art. That evening’s Egan Library speaker is current Audubon Alaska Director of Bird Conservation Matt Kirchoff. The former UAS faculty member will present a peak into the daily life of the murrelet, both above and below the surface in Glacier Bay. October 9 in the Egan Library, author, academic and activist Riki Ott shares the long ranging effects of the Exxon Valdez oil spill two decades later in her talk, “Not One Drop: Why it is not okay to Drill, Drill, Drill.” All Evening at Egan events are scheduled for either the Egan Library or Lecture Hall depending on the crowd expected. For locations and complete list and descriptions of the series, visit the Evening at Egan Webpage.